Although their campaign has concluded, if you would still like to make a donation to support Pitt Dhirana you may always do so here. 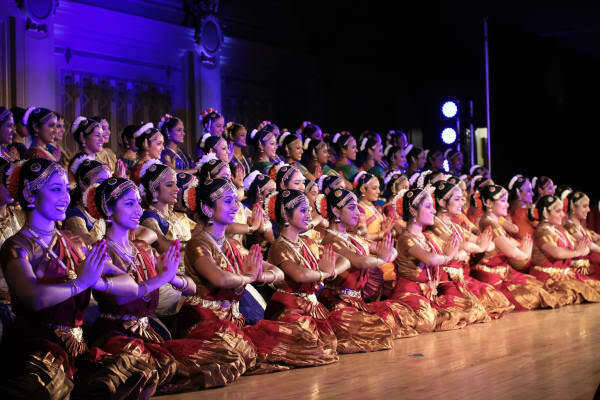 Dhirana is the University of Pittsburgh's annual Indian classical dance competition. It is a nonprofit organization and all proceeds of the competition go to the Birmingham Free Clinic of Pittsburgh, which provides free medical care for Pittsburgh's underserved population. Pitt began the tradition of hosting a national, intercollegiate competition when Pitt Nrityamala placed first in Laasya 2011. As champions, the team won the honor of hosting Laasya 2012 on their campus. With strong support and attendance from the Pittsburgh community and enthusiastic involvement from Pitt students, Laasya 2012 was a resounding success. Unhappy to see the traveling competition leave its city, Pitt Nrityamala and University of Pittsburgh created Dhirana to foster Indian classical dance interest in their community. This competition provides collegiate classical dance teams with a platform to showcase their talents during an unforgettable weekend experience. Pitt welcomes you to its sixth annual Indian classical dance competition, Dhirana 2018! To promote awareness of Indian classical dance, provide a platform for collegiate dancers to continue pursuing the art, and better the Pittsburgh community through philanthropy and service. As 100% of all proceeds from ticket sales from the event go directly to the Birmingham Free Clinic, we rely on generous sponsors like you to be able to host our competition. 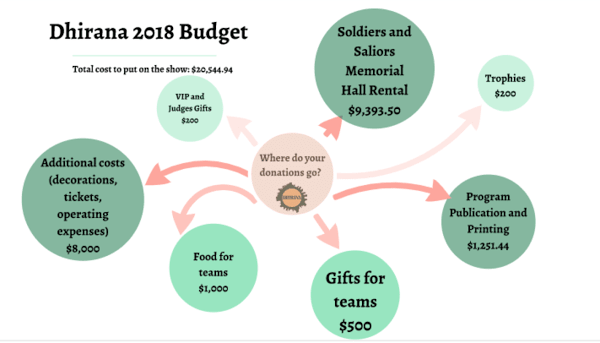 We aim to raise $2,000 over the next two months in order to pay for various costs of the competition, such as the venue, lighting, and audio for the event. We greatly appreciate each and every donation as we prepare to host Dhirana 2018! We thank you for your generosity and support and extend to you an invitation to attend Dhirana on March 17, 2018 at Soldiers and Sailors Memorial Hall. For more information on Dhirana 2018, please visit our website. You are also always free to email us at dhirana.sponsorship@gmail.com with any questions you may have! The total cost of putting on the show is $20,544.94. To reach our goal, we coordinate several fundraising events, sponsorship events, grants, and our EngagePitt campaign. It has always been Dhirana’s top priority to have one-hundred percent of the proceeds from ticket sales donated to the Birmingham Free Clinic. To help us maximize this amount, we appreciate any contribution to our cause. All ticket-sale proceeds from Dhirana 2018 will go directly to the Birmingham Free Clinic. The Birmingham Free Clinic Salvation Army Homeless Drop-In Center serves uninsured and indigent clients from the South Side Salvation Army programs and the general public. It is also the only free clinic in southwestern Pennsylvania to serve the growing numbers of uninsured Latino adults and children in our region. The Saturday clinic session is staffed with medical student interpreters who speak Spanish. The clinic exclusively utilizes a volunteer group of health care providers. 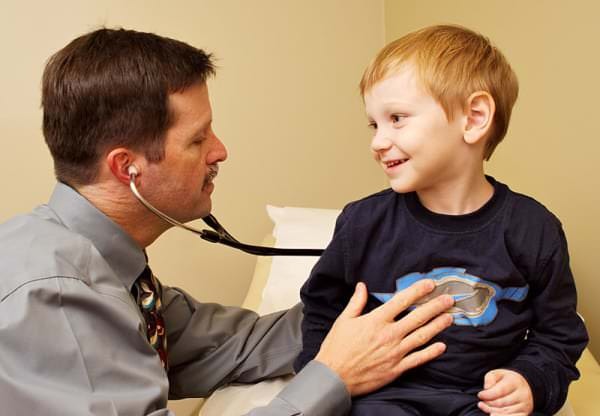 Services include primary and acute care, chronic disease management, physical exams, medication access and management, tuberculosis testing, influenza vaccines, health education, and on-site specialty consult services for cardiology, dermatology, vision, endocrinology, and pulmonary problems. In the past five years, Dhirana has donated over $50,000 to the Birmingham Free Clinic. Alarippu is the first dance piece a Bharatnatyam dancer learns and performs. This dance offers respect to God and the audience. This donation will be used to pay for prizes for the teams. Pushpanjali is the opening dance in a performance. It is the salutation to the lord of dance Nataraja, the Guru (dance teacher), the musicians and the audience. This donation will be used to pay for trophies and gifts for the teams. Jatiswaram is the next dance in a performance after Alarippu. It is a technical dance that showcases the form of Bharatnatyam, without any words. This donation will be used to pay for t-shirt printing. Kouvtuam is a piece that combines technique and expression in praise of a God. This donation will be used to pay for program printing. Thillana is a rhythmic piece that is usually performed at the end of a dance performance. It is one of the hardest dances to master technique wise. This donation will be used to pay for audio and lighting for the venue. Padams are pieces of reverence and expression during devotional religious prayer. The music that accompanies this dance is lighter and more emotional. This donation will be used to pay for audio and lighting for the venue. Varnams are the centerpieces of an arangetram (Bharatnatyam dance recital). These dances are performed to the most complex pieces of Carnatic music. This donation will be used to pay for the rental costs of the venue.